Since I first learned to read I’ve read voraciously. Reading allows me the opportunity to step into someone else’s story and experience their adventures and misadventures. As I enter into this other life through the portal of a book I find myself asking ‘how would I respond in this circumstance?’ In November 2010 the book group I belong to read “Choosing to See” by Mary Beth Chapman. The book tells the story of the accidental death of their little five year old girl and recounts the impact on the family focusing primarily on Mary Beth. Mary Beth’s story did cause me to think into that kind of loss, but I have to say that it didn’t come close to preparing me for the experience of losing Becky. their loss and the impact on their lives and emotions. Some authors are offering helps and encouragement about how to make it through such an experience. There are authors with advanced academic degrees and authors with only life experience. There are authors who approach grief and loss from within a framework of faith and those who do not. So many books on grief . . . so much grief. As I’ve read I’ve gleaned truth from every book. Not everything I’ve read rings true, but everything I’ve read has included something that resonated of truth. Nearly every grief book grants expansive permission to grieve in whatever way grief comes to a person. On some level I agree with this concept, but I also wonder if, as in all of life, there is a way to grieve that dishonors God and threatens our ability to live and thrive? The proverb quoted at the beginning of this Gleaning encapsulates the concern behind my question. I was impressed to see that this Proverb is repeated word for word within such a short span of scripture. This concept is important. I want to grieve in a way that leads to life. I want to live in a way that leads to life – both for me and others. 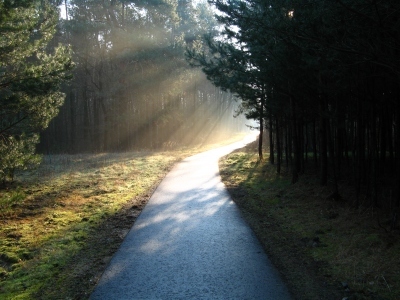 Lord – I look to You to lead me in the right path in every moment and every aspect of my life. Even as I walk through the valley of the shadow of death lead me to life. Keep me from those comforts that ease my heart, but that can capture me in a snare I can’t readily escape. Be my comfort and peace and life. Where there is shadow there is light – look to the light! This entry was posted in Grief and tagged books, grief, other's stories, read, reading, story, the way, the way to grive. Bookmark the permalink.